Ketoacidosis and Ketosis: What's the Difference? Some medical professionals confuse ketoacidosis, an extremely abnormal form of ketosis, with the normal benign ketosis associated with ketogenic diets and fasting states in the body. They will then tell you that ketosis is dangerous. 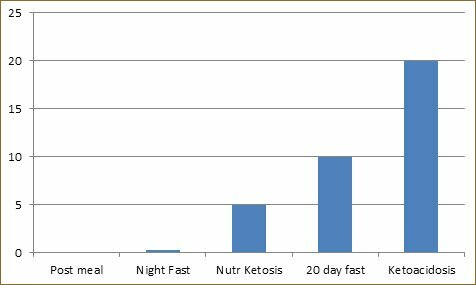 Benign nutritional ketosis is a controlled, insulin regulated process which results in a mild release of fatty acids and ketone body production in response to either a fast from food, or a reduction in carbohydrate intake. Ketoacidosis is driven by a lack of insulin in the body. Without insulin, blood sugar rises to high levels and stored fat streams from fat cells. This excess amount of fat metabolism results in the production of abnormal quantities of ketones. The combination of high blood sugar and high ketone levels can upset the normal acid/base balance in the blood and become dangerous. In order to reach a state of ketoacidosis, insulin levels must be so low that the regulation of blood sugar and fatty acid flow is impaired. Fact 1: Every human body maintains the blood and cellular fluids within a very narrow range between being too acidic (low pH) and too basic (high pH). If the blood pH gets out of the normal range, either too low or too high, big problems happen. Fact 2: The human pancreas is an organ which secretes insulin, a hormone that helps the body manage blood sugar and fat storage. Without insulin, the body cannot utilize glucose for fuel in the cells, AND cannot store fat in the fat cells. This is why one of the symptoms of Type 1 diabetes is unexplained weight loss. Type 1 diabetics have pancreatic damage which results in a complete lack of insulin production, and as a consequence, their fat cells have no insulin message telling them to "hold on to those fatty acids". Without that message from insulin, large quantities of fatty acids flow out of the fat cells and are broken down in the liver into a ketone body called acetoacetic acid which is then converted to two other circulation ketone bodies, beta-hydroxybutyrate and acetone. This is ketosis, but an unrestrained, abnormally excessive ketogenesis. The danger is in the amount of ketone bodies being released. Because ketone bodies are slightly acidic in nature, and so many are released at once in a uncontrolled event, they build up in the bloodstream. The sheer volume quickly overwhelms the delicate acid-base buffering system of the blood, and the blood pH becomes more acidic than normal. A change in blood pH causes many unhealthy downstream effects. It is not the ketone bodies which are dangerous, it is the low blood pH, a condition called acidosis. Acidosis symptoms include fruity breath (from the acetone), nausea, hyperventilation, (deep, rapid breathing) dehydration and low blood pressure, as the body tries to rid itself of the abnormal amounts of ketones through the lungs and urine. If left untreated, acidosis can result in a coma and death. Treatment includes the administration of insulin to slow the ketogenensis and fluid replacement to correct dehydration. Type 1 diabetics can develop diabetic ketoacidosis if they don't inject enough insulin, and this usually occurs during a period of illness or injury, or it may be the precipitating condition which results in the diagnosis of their type 1 diabetic disease. This paper published in Diabetic Medicine discusses several cases in which the drug Ecstasy combined with the excessive movements of rave dancing caused acidosis. 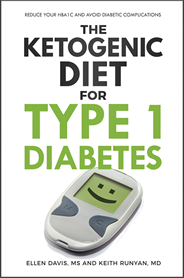 The condition of nutritional ketosis which is associated with a properly formulated ketogenic diet is not dangerous and is regulated by insulin levels within the body. Nutritional ketosis is simply the metabolic process of burning your own body fat for fuel, and unless you are diabetic and lacking insulin, or you are a raging alcoholic, it is perfectly safe. Levels for adults with a working pancreas and insulin production rarely get above 8-10 mmol/L, even after more than 30 days of total fasting. Here's another explanation from Dr. Peter Attia, a physician with extensive knowledge about ketosis.